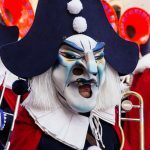 The annual Fasnacht festival in Basel offers marching bands wearing monstrous masks, soup made from flour and onions, rude satirical poems and a parade starting at 4 in the morning. How can you resist? A parade that starts at 4 in the morning? With piccolos? And drums? In winter? Really? Yes, and you’ll be enchanted by the whole thing. 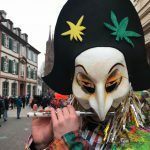 Every year in the city of Basel on the Monday after Ash Wednesday (this year, March 6th), the Morgestraich (“Morning sweep” in Basel dialect) marks the beginning of the three-day Fasnacht festival. 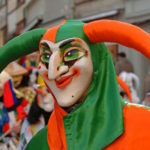 This is said to be the only Protestant carnival in the world. But what Protestants lack in quantity, they make up for in quality. Fasnacht is a kaleidoscopic surreal experience that would be the stuff of nightmares with the enormous scary masks and costumes participants wear, except that a sense of crazy fun envelopes everything thanks to the cheery music being played by the costumed players of piccolos, drums and brass instruments, plus the colourful floats from which creatures fling confetti, candy and fruit. The festival begins at the aforementioned brutal hour of 4 a.m., but that parade, lit only by the big, beautiful, one-of-a-kind lanterns, is pure magic. All the lights in Old Town are turned off before the lanterns, many with darkly funny political messages, seem to float through the dark streets. Fasnacht continues for exactly 72 hours. (Yes, you can expect every phase to begin exactly on time.) Fortunately, most of it takes place at more reasonable times of the day. Grand, crazy parades take place both Monday and Wednesday afternoons. There are wandering drum-and-fife groups on the side streets, plus an evening concert of brass bands, plus satirist poets who appear here and there on a corner or by the bar to distribute their diatribes on coloured paper, and speak and sing their sardonic poems. Participant groups may be dressed in anything from screaming monkey masks or pineapple helmets to colour-coordinated bathrobes. There’s food and drink everywhere, at sidewalk kiosks, cafés, bars and restaurants, all of them serving traditional hearty cold-weather fare like rösti with pork and mushrooms in cream sauce. Or sausages with a hunk of bread and mustard. Or mehlsuppe, a traditional soup made from beef broth, flour, onions and salt, which tastes pretty much how it sounds, so you may want to wash it all down with cold beer or hot mulled wine. 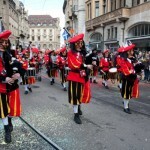 Fasnacht is hugely popular in Switzerland and bordering France and Germany. Tens-of-thousands of visitors come each year. Some of them return year after year. Maybe you will become one of them. When: Starts at 4am on 6 March 2017 and runs for 72 hours. Went a couple of years ago.